We are thrilled to announce the 2019 QuiltCon Charity Quilt Challenge! This is one of the MQG’s largest scale charity projects and we look forward to getting many guilds and teams of individual members involved in the challenge. This year, we want to encourage individual members to form teams and work together. We are calling these Individual Member Teams (IMTs). IMTs must have a minimum of four MQG individual members (the maximum size is up to you). The IMT must appoint two individuals as the leaders who will coordinate and communicate with the MQG. The 2019 design theme is small piecing. 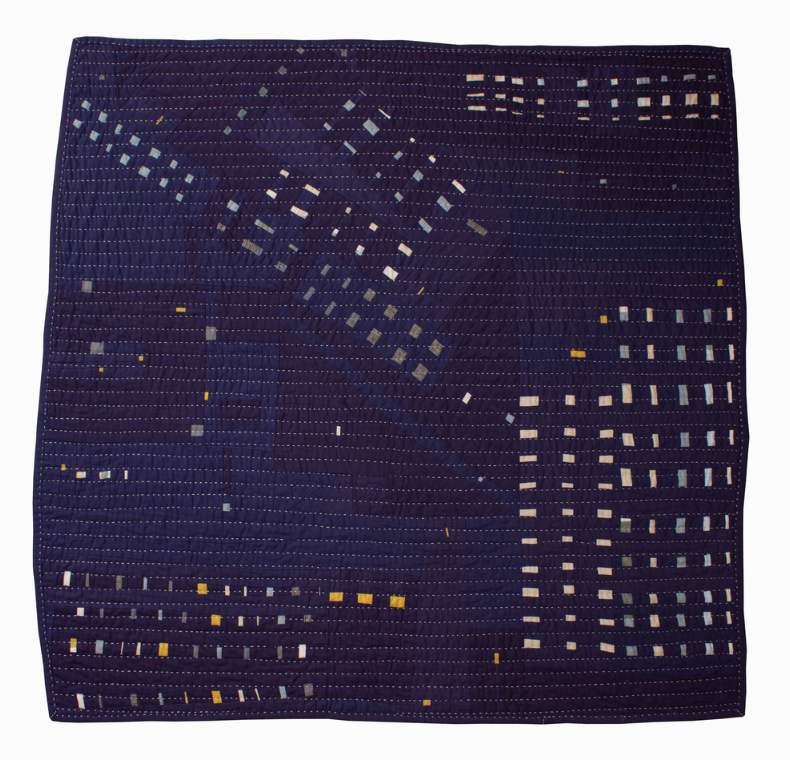 You have probably noticed some modern quilters using small piecing in recent years. While it can be hard to define, let’s say that small piecing would incorporate fabric pieces that are smaller than 1” in either width or length. So you might picture long, skinny strips, or little tiny squares, for example. The small piecing can be improvisationally pieced, traditionally pieced or foundation pieced. It’s up to you. Remember, the quilt doesn’t need to be exclusively small piecing. Small piecing must be an integral part of the design but you can incorporate other modern design elements, such as negative space, to make the challenge more approachable. 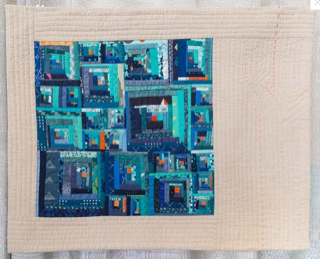 We have put together a gallery of images of quilts that incorporate small piecing to help inspire and guide you. The color palette is shown here. No, you don’t need to use all the colors in this palette—your team can be selective if you prefer and limit your palette to just a few of the colors shown. Also, you do not need to use the specific fabrics listed by the manufacturers below, but seeking out some of these solids might help you pin down the color palette. Once you have some of these solids on hand, it is easy to pull prints from your team’s stash that coordinate. And YES, you can certainly use modern prints too! When choosing prints, it is best to look for prints that are monochromatic or even tone-on-tone prints rather than those that include other colors since those colors may not be part of this color palette. Please note the colors listed below are approximate and may not match exactly to the color palette above. Free free to use your best judgement when matching color palettes. Leaders of all of the local MQGs will receive a signup link via email by May 25, 2018. Please make sure this is filled out and submitted to the MQG by October 8, 2018. When you sign up, you are expressing your guild’s intent to complete a quilt for the charity challenge. You will not need to complete an entry form for the show. This is all you need to do in order to sign up. Please understand that this is a firm deadline. Each IMT should select a team leader who will be the single point of contact for the team. The leader should email our QuiltCon Charity Quilt Challenge Coordinator, (Amy Friend at charity@themodernquiltguild.com) to receive a link to a form that must be filled out by October 8, 2018. You will need to choose a team name and two coordinators. 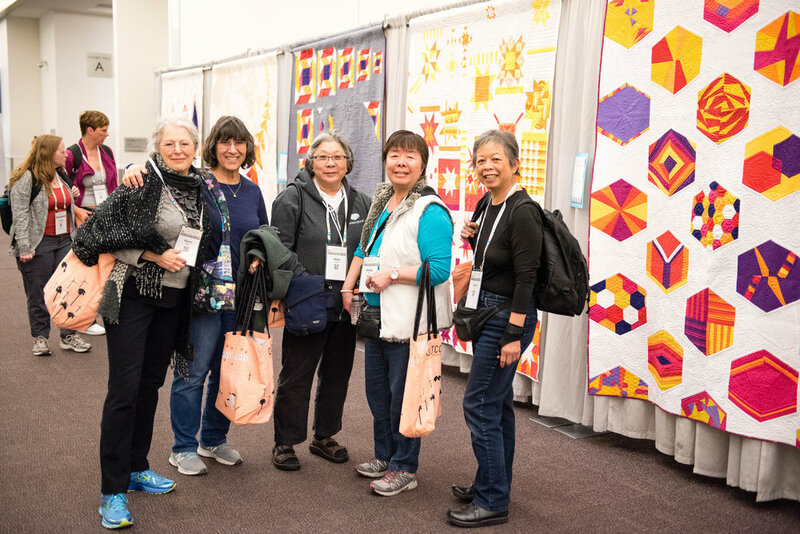 The MQG will feature selected guilds and Individual Member Teams and their quilts in our Communications in 2019, so make sure you collect the best photos of your process and stories! As in the past, Individual Member Teams and guilds will be asked to donate the finished quilt to their local communities! 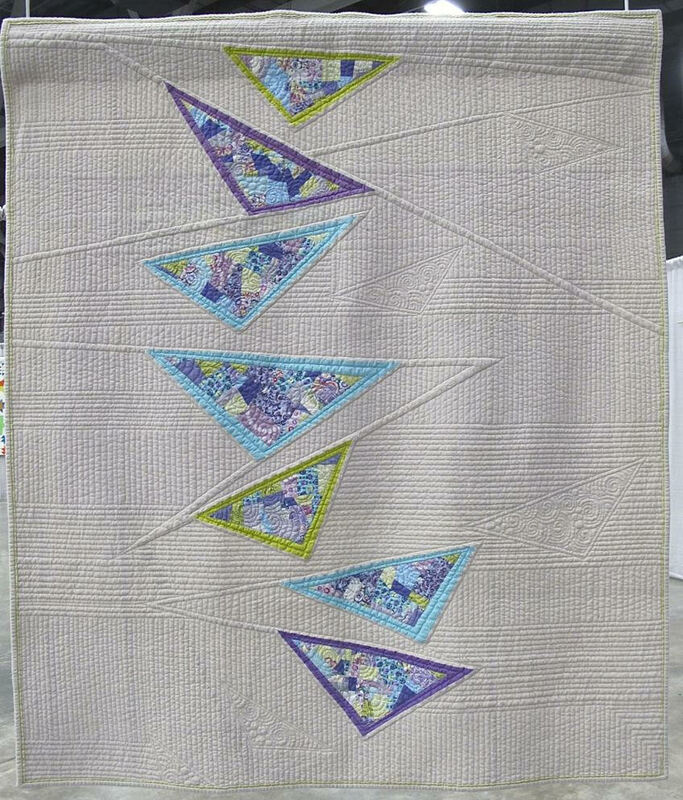 After the quilts are displayed at QuiltCon, guilds are asked to donate the completed quilt to the charity of their choice and notify the MQG of those details. The deadline for quilts to arrive is February 8, 2019. Mailing information will sent in late 2018. If you need help, please visit the Community site or feel free to email our QuiltCon Charity Quilt Challenge Coordinator, (Amy Friend at charity@themodernquiltguild.com). Thank you for your interest in completing the QuiltCon Charity Quilt Challenge. We hope that this information is helpful. If you have any questions you can post them in the forums on Community here, or feel free to email us at info@themodernquiltguild.com. The signup link will be emailed to guild leaders and individual members by May 25, 2018. Guilds and teams will select two charity quilt contact persons to coordinate and communicate with the MQG. Once the form is filled out and the teams established, please start researching, brainstorming, designing and making your quilt! Guilds and Individual Member Teams will complete a quilt using the predetermined color palette. Guilds and teams will design and complete the quilt using small piecing as an integral part of the quilt design. If your guild or team decides to use a pattern, be sure to get permission from the pattern designer and include that information when you submit the quilt to QuiltCon! Your guild or individual members team will collaborate to create the design and piece the blocks for the quilt. Your guild or individual members team will provide batting, backing, binding and additional fabric to complete the quilt top. Quilts should twin size which is 65” x 88”. Quilts should be no larger than 72” x 92”. Quilting must be no farther apart than 2”. These quilts will be used, so please make sure they are sturdy. Machine sewn bindings are ok.
We will send all information about shipping your quilts to QuiltCon in December 2018. Please submit your group's charity quilt information using this link. This will be displayed with your quilt at QuiltCon 2019 in Nashville. Your Guild or Individual Member Team may submit an optional blog post article with 3-5 accompanying photos discussing the process of designing and completing your guild’s quilt. These posts are due by March 31, 2019. We will email directions on submitting your content in October 2018.